Increase in number of medication error-related deaths and stringent health care regulations have driven health care providers and retail pharmacists to focus on improving their outpatient services. Pharmacists are constantly looking for advanced technology solutions, ranging from a tablet counter to a compact dispensing robot, in order to improve their pharmacy workflow. Rise in number of outpatient visits encourages pharmacists and hospitals to incorporate automated systems in order to improve their prescription-handling capacity. The global pharmacy repackaging systems market continues to expand at a high growth rate. This expansion is driven by the increasing number of medication errors and rising need to improve patient safety. The global pharmacy repackaging systems market is projected to expand at a significant growth rate in the next few years due to rising awareness about benefits of automated systems among health care providers and pharmacists. Incorporating packaging operations within the facility helped hospitals (and also long-term care and retail pharmacies) decrease the costs associated with wasted medication and improve their drug inventory management. Costs are curbed by packaging bulk medication, instead of purchasing pre-packed unit doses from the manufacturer. The pharmacy repackaging systems market is also driven by technological features that allow end-users to incorporate technologies to strengthen their entire process workflow toward enhancing patient safety. High cost of implementation and lack of awareness about benefits of pharmacy repackaging technologies are key factors that are likely to restrain the market. Globally, the pharmacy repackaging systems market has been segmented based on product type, end-user, and region. In terms of product type, the market has been classified into blister card/compliance packaging systems, pouch packaging automation systems, bottle filling/ pill counting automation systems, liquid medication packaging systems, and others. In terms of end-user, the market has been segregated into retail/community pharmacy, hospital pharmacy, long-term care (ltc) pharmacies, and mail order pharmacies. Based on region, the market has been split into North America, Europe, Asia Pacific, Latin America, and Middle East & Africa. Rising awareness about the benefits of pharmacy automation technologies, such as automated repackaging, has prompted small and midsized health care institutes and pharmacists to replace their traditional pharmacy operation methods with these technologies. According to the Johns Hopkins University, on an average, 250,000 people in the U.S die due to medical errors. Health care providers and pharmacists are focusing on improving outpatient medication to improve operational efficiency, in terms of staff productivity and patient safety. Health care infrastructure in developed regions, such as North America and Europe, is well-established and has been focusing on development of their medication workflow by shifting toward pharmacy automation systems, including repackaging systems. Moreover, promising reimbursement programs in these regions are anticipated to fuel the demand for these technologies during the forecast period. The U.S and Canada are major markets in North America. These countries are rapidly advancing the frontiers of technological development as well as enacting stringent standards for medication management. This, in turn, is likely to propel the demand for repackaging systems that cater to the basic requirement of customized dosage in various end-user domains. Retail and community pharmacy is estimated to be a highly lucrative segment from the investors’ perspective. The automation requirements in pharmacies are expected to rise at a high rate owing to the rapidly increasing number of large chain pharmacy stores in developed regions as well as increasing demand for automated systems to cope with the increased pharmacy needs in developing regions. Rate of hospital pharmacy repackaging in North America is very high and almost all hospital pharmacies are employing some kind of automated system to improve the performance of their pharmacy operations. The same trend is being observed in Europe, Japan, and China. This factor is anticipated to propel the hospital pharmacy segment during the forecast period. Major companies operating in this market include Omnicell, Inc., Becton Dickinson & Company (CareFusion Corporation), Kirby Lester, Swisslog Holding Ltd., Yuyama Co., Ltd., TCGRx, ARxIUM, Takazono Corporation, Parata Systems, and Pearson Medical Technologies. This report on the global pharmacy repackaging systems market analyzes the current and future prospects of the market. The report comprises an elaborate executive summary, including a market snapshot that provides overall information of various segments and sub-segments. The research is a combination of primary and secondary research. Primary research formed the bulk of our research efforts along with information collected from telephonic interviews and interactions via e-mails. Secondary research involved study of company websites, annual reports, press releases, stock analysis presentations, and various international and national databases. The report provides market value in terms of US$ Mn for each segment for the period from 2016 to 2026, considering the macro and micro environmental factors. 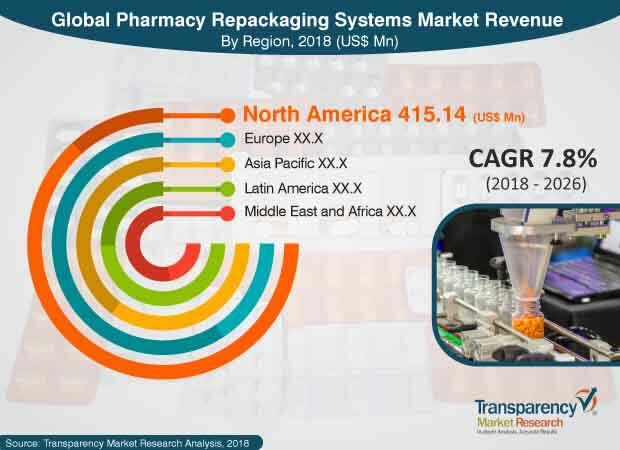 Growth rates for each segment within the global pharmacy repackaging systems market have been determined after a thorough analysis of past trends, demographics, future trends, technological developments, and regulatory requirements. A detailed qualitative analysis of factors responsible for driving and restraining market growth and future opportunities has been provided in the market overview section. This section of the report also provide insights into the key trends of the pharmacy repackaging systems market such as outsourcing to third party repackaging companies. The key market indicators influencing global pharmacy repackaging systems market taken into consideration including cost constraints and regulatory landscape. The report also includes market attractiveness analysis of the major segments that provides a thorough analysis of the overall competitive scenario in the global pharmacy repackaging systems market. The report also highlights key events of the global pharmacy repackaging systems industry. A value chain analysis along with list of major players, hospitals and distributors is also included in the report. Market value in terms of US$ Mn for the period between 2016 and 2026 along with the compound annual growth rate (CAGR %) from 2018 to 2026 are provided for all the segments, considering 2017 as the base year. The year-on-year growth of the global pharmacy repackaging systems market for each segment is also reflected. Additionally, market related factors such as increasing preference for product innovation, cost reduction for hospitals, greater affordability for patients in various geographies, and historical year-on-year growth have been taken into consideration while estimating the market size. Based on product type, the global pharmacy repackaging systems market has been segmented into blister card/compliance packaging systems, pouch packaging automation systems, bottle filling/ pill counting automation systems, liquid medication packaging systems, and others. Based on end-user, the market has been classified into retail/community pharmacy, hospital pharmacy, long-term care (ltc) pharmacies, and mail order pharmacies. The retail/community pharmacy segment is expected to dominate the market during the forecast period. In terms of region, the global pharmacy repackaging systems market has been split into five regions: North America, Europe, Asia Pacific, Latin America, and Middle East & Africa. Additionally, the regions have been further segmented into major countries from each region. These include the U.S., Canada, the U.K., Germany, France, Italy, Spain, China, Australia, India, Japan, Brazil, and Mexico. The report also profiles major players in the pharmacy repackaging systems market based on various attributes such as company overview, financial overview, SWOT analysis, key business strategies, product portfolio, and recent developments. A thorough market share analysis of major companies operating in the pharmacy repackaging systems market is provided in the report. The report also includes a competition matrix that provides insights into recent developments and activities done by the major market players. Key companies profiled in the report include Omnicell, Inc., Becton Dickinson & Company (CareFusion Corporation), Kirby Lester, Swisslog Holding Ltd., Yuyama Co., Ltd., TCGRx, ARxIUM, Takazono Corporation, Parata Systems, and Pearson Medical Technologies.